Stories from Recoverees - Liberation Programs, Inc.
Recoverees express their feelings here about their personal journeys of recovery and their time spent with Liberation Programs. The women of Families in Recovery penned this poem about the painting generously donated to the program by Arlene and Reuben Mark. 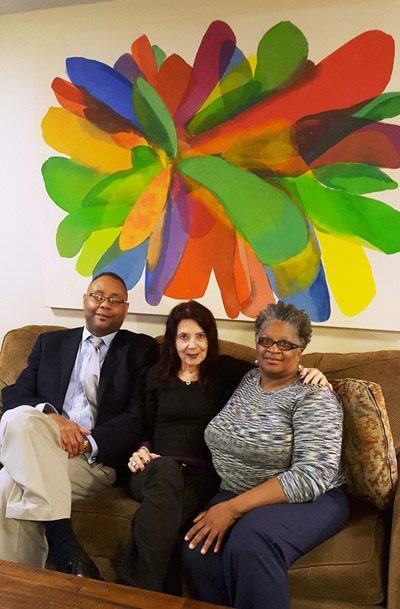 Pictured here are Liberation’s President and CEO Alan Mathis, Arlene Mark, and Director of Youth and Family Services Maggie Young. The following poem is by one of our Outpatient Recoverees in reflection of her own recovery journey. Helping us, the lost ones find our self-worth. Believed in me when no one would. I’m becoming who I am with the help of you. A place that feels like home. And Let Go of all I’ve known. They’ve taunted and showed me who I am. But I won’t let them grab me and take my wings. I’m on both feet but on my knees praying.